New 'phablets' product category joins the already congested smartphone, tablet and hybrid market. The never-ending battle for the best smartphone has reached new heights post Mobile World Congress (MWC). This year's show, held in Barcelona saw an influx of smartphone-and-tablet hybrids known as 'phablets'. In essence small tablets with calling functionality, a typical phablet will also include a stylus. Device makers including ZTE, Samsung, LG and Asus displayed phablets of all sizes at MWC. For those who would rather carry a single device than both a phone and a tablet, a phablet may well appeal. The results of a recent PCA poll suggests that 35 percent of respondents plan to buy one this year. There has also been plenty of big smartphone launches of late, with the Sony Xperia Z, HTC one and samsung Galaxy S4 stealing many of the headlines. Nokia is making an increasing number of windows Phone 8 handsets at all price points, and even Blackberry is hoping for a comeback with it BlackBerry Z10 smartphone running BlackBerry 10 OS. "By the end of 2017 IDC forecasts 1.5 billion smartphones will be shipped worldwide"
As usual, the year has kicked off with smartphone launches at both CES and MWC. However, reminiscent of Apple's keynotes, more vendors are holding their own events to launch flagship devices. It makes sense: at a huge show such as MWC, each manufacturer is fighting for the attention of media attendees.Having a solo launch means the spotlight is directed on a single device. Samsung waited some time after MWC 2012 to launch its Galaxy S III, which surfaced in may last year. HTC also managed to successfully steal the limelight by announcing its One at a London launch event just before MWC 2013. Samsung's Galaxy S4, meanwhile, was announced as we went to press a month after MWC. 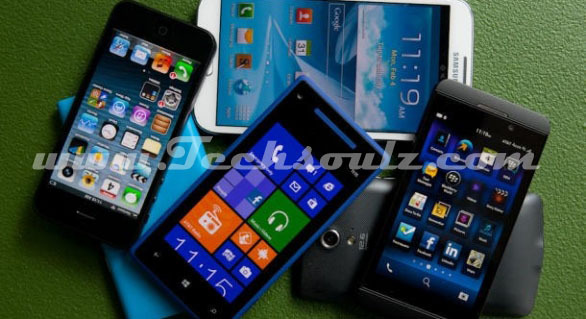 Research firm IDC forecasts that for the first time manufacturers will ship more smartphones than feature phone in 2013. The firm predicts smartphone shipments will surpass 918 million units worldwide. This figure is based in part on the falling price of smartphones, as well as increased availability and consumer interest worldwide. The rollout of 4G LTE networks has also had a positive impact. "By the end of 2017 IDC forecasts 1.5 billion smartphones will be shipped worldwide" said IDC. The competition has become so fierce that even the manufacturers have resorted to criticising rival products. Following the launch of the S4, HTC released a statement that said its plastic build "pales in comparison to the all-aluminium unibody HTC One". And Apple marketing CEO Phil Schiller has openly condemned the Android OS for its fragmentation.